Engineered for drivers with a passion for performance, the FIAT® 500 Abarth puts legendary racing heritage into an exhilarating, track-ready package with modern styling and a long list of standard comfort and technology features. Turbocharged, lowered and tuned, with 160 horsepower and 170 lb-ft of torque, the FIAT 500 Abarth is built to deliver non-stop driving thrills. 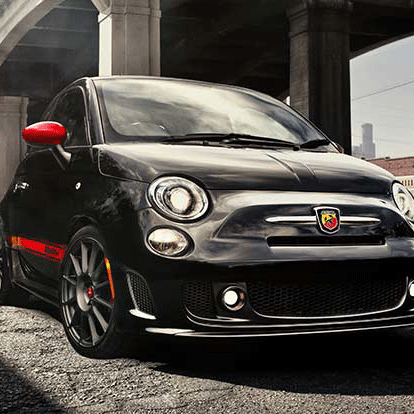 The FIAT® 500 Abarth has an unmistakable look – a bold, aggressive stance that makes a dramatic statement about the power within. The aerodynamic fascias and spoiler, together with side-sill ground effects, create an athletic profile while adding road-gripping downforce. Available accent-colour mirror caps and body-side stripe leave no doubts about the Abarth's racing pedigree. The FIAT® 500 Abarth's cockpit is inspired by the demands of the track. High-back bucket seats with wrap-around side bolsters keep you positioned comfortably when accelerating through tight corners. The flat-bottom perforated leather-wrapped steering wheel provides optimum space efficiency, while aluminum pedal covers provide a distinct racing look and feel underfoot. Engineered for optimum weight, performance and style, the wheels of the FIAT® 500 Abarth bear the final responsibility for converting the car's impressive horsepower and torque into equally impressive action. Standard 16-inch cast aluminum wheels are outfitted with race-ready Pirelli 4-season tires. New 16-inch Hyper Black aluminum wheels are now available, along with 17-inch forged aluminum wheels in Hyper Black or Gloss White finish. The FIAT® 500 Abarth comes ready to deliver audio performance to match its track performance via a standard 6-speaker Alpine® sound system with AM/FM/CD/MP3 and auxiliary input jack. You also have the option of turbocharging your sound with the available studio-quality Beats AudioTM system, featuring an 8-inch subwoofer and a generous 368-watt 8-channel amplifier. Every powertrain component is engineered to deliver on the MultiAir® engine's turbocharged, track-ready promise. This durable, heavy-duty 5-speed manual transmission is no exception, geared to offer quick acceleration and impressive top speed without sacrificing outstanding fuel efficiency. Throughout the FIAT® 500 Abarth, precision-engineered components work together to maximize on-road performance as well as comfort. Dual-valve Frequency Selective Damping (FSD) KONI® front shock absorbers deliver maximum grip, while stiffer spring rates and a 0.6-inch (15 mm) lower ride height improve handling and minimize body roll. The FIAT® 500 Abarth features an exclusive analogue turbo boost gauge which serves double duty as an indicator of turbocharger pressure as well as a shift indicator. The shift light signals the optimum point for changing gears and adjusts its recommended shift point toward the redline when Sport mode is activated. Passenger safety is of utmost importance both on the track and in everyday driving. That's why you'll find a host of advanced safety features like 7 standard air bags6, Electronic Stability Control7, antilock brakes and more in the FIAT® 500 Abarth. Several advanced safety systems help ensure your FIAT® 500 Abarth is always moving in the right direction. Three-mode Electronic Stability Control7 helps maintain directional control, while all-speed traction control limits wheel spin for maximum traction. Hill Start Assist helps prevent rollback when starting by sustaining brake pressure briefly after you take your foot off the pedal. To provide stopping power with proportionate response and finesse, the FIAT® 500 Abarth features a high-performance brake system with semi-metallic brake linings at all 4 corners. Larger 11.1-inch ventilated rotors (up from 10.1-inch) provide greater stopping power. Both front and rear brake calipers are lacquered in Rosso (Red) paint for an athletic, track-ready appearance. TAKE THE 2014 FIAT ABARTH 500 FOR A SPIN!